Archery has been around for at least 10,000 years as an essential activity across many cultures all over the globe. The way we learned to fire arrows, at least around most the western hemisphere, didn’t happen from one day to the next. Today, we use what’s called a Mediterranean draw, which consists of using three fingers, index, middle, and ring, to pull the string. This form is not only considered the most reliable way to shoot a bow, but it’s also why gloves for this activity exist at all, and the reason you need a pair should you decide to participate in what has been a favorite pastime over the last ten centuries. Are Archery Gloves a Must? In any bow-related activity, whether hunting or just recreational shooting, a good product prevents immediate injuries and future consequences regarding your draw fingers. To understand the importance of this equipment, we have to discuss what it does in the first place. A glove reduces the fatigue that comes from the constant force applied to your extremities each time you pull back an arrow. Second, they serve as good protective gear in case your hand gets caught between the bowstrings after firing an arrow. On prolonged archery sessions, you need to protect your joints, because in the best case scenario your hand becomes tired more quickly. Injury from this activity is not just a couple of blisters and scratches, but fatigue from the continuous use of your three fingers which can develop into a sprain. In the worst case scenario, we’re talking about the complete loss of movement and use of your joints. Even different styles of shooting require a different type of equipment to avoid damage. For example, using thumb rings with the Mongolian draw which is a popular draw in Asia. What Makes a Great Pair of Archery Gloves? ​Generally speaking, leather is the most used material on fingertips because it's durable, adaptable, and robust. These are qualities necessary to keep your fingers safe. Many models also come in polyester for the rest of your hand, and this makes it more breathable which is good when dealing with sweat. There are alternatives made of suede or canvas, each having some advantages and issues that we’ll cover depending on the model. Many gloves come in a simple three-finger type of design that is easier to carry and wear. There are others that cover the full hand which offers more protection and grip. Either way, not all models fit both hands, and you should choose depending on which hand is your dominant one. ​It's better to have something that is cost-effective. Some options may be more expensive than others, but this does not mean much in terms of quality. Frequently, It all depends on the material and the design. The NEET Suede is a well-designed and comfortable glove that not only helps you avoid exhaustion but allows you to keep a sturdier grip on the arrow, resulting in better accuracy. 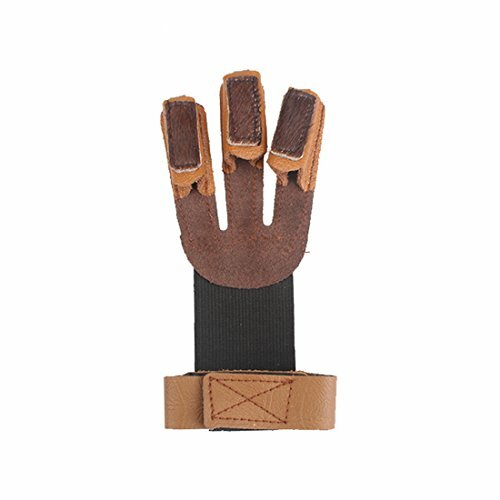 This piece of equipment is half suede leather, which tends to perfectly fit on fingers, with a Velcro band to adjust to your wrist and keep it firmly in place. The fingertips are reinforced to protect the tip of your finger, but they tend to be pretty stiff upon arrival, so the material needs to be broken into with repeated use, as happens with most leather equipment. The design is functional and simplistic which makes it easy to get it off/on your hand. It is also designed to fit both hands perfectly for people that desire a left-handed choice. People tend to have problems with the sizing, as some users have complained that they would have preferred a bigger size than the one delivered. 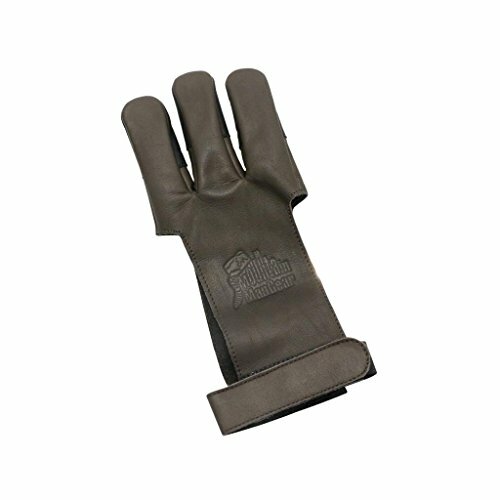 When it comes to durability, the glove can withstand continued draw weight of 60 lbs without much deterioration, which means it’s durable. This piece of equipment is a perfect option for those that want a well-balanced glove with reinforced fingertips. This results in shooting being a less complicated activity, while at the same time protects your extremities. It has a great design that improves the user's accuracy. Just be sure to order a size larger than the one you are planning to get. A common problem that some glove wearers run into is the lack of feeling on the fingers, hurting your grip and therefore affecting how accurate your shot is. 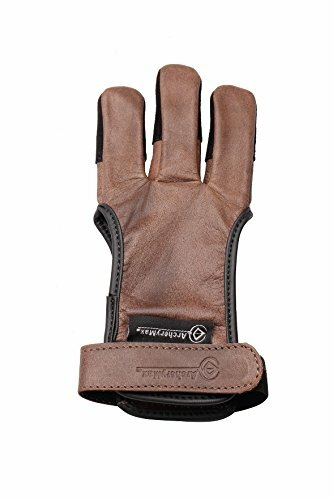 This product has the advantage of both having reinforced fingertips for added protection, and a soft cowhide leather material, which lets the wearer have a better feel of the arrow, resulting in a better grip. One of the most relevant details to keep in mind while defining the power of a bow is the draw weight, which consists of how much force can be applied to the bowstring while firing the arrow. For activities like hunting, it is better to have a model with higher draw weight, but this also has a more significant impact on your fingers, and that’s why reinforced fingertips are required. All leather material eventually wears out, but this model can easily withstand bows with a draw weight of 60 lbs for more extended periods. The experience becomes better once the product has been used more or broken in. Some people have run into problems with fitting, so it’s advisable to order a size bigger than your actual one. If you’re left-handed, this is the perfect leather model. It provides enough protection for people that desire to shoot bows with a high draw weight. Your finger won’t develop blisters or go numb with repeated use. It demands some use to break in and feel more natural. You have to keep in mind that a bigger size may be the best option to get. Younger people may have it harder when looking for a product that offers them a good grip, which is essential for protection. This glove has two options to order a model that fits perfectly in the hands of a young or an adult user. It doesn’t mean that it’s less protective or effective since it has a thick layer of horse hair on the fingertips that keep your pointers protected. This feature doesn't necessarily mean this is just an option for beginners as it can also be useful for experienced individuals, or people that don’t have an appeal for other types protective gear, like tabs. 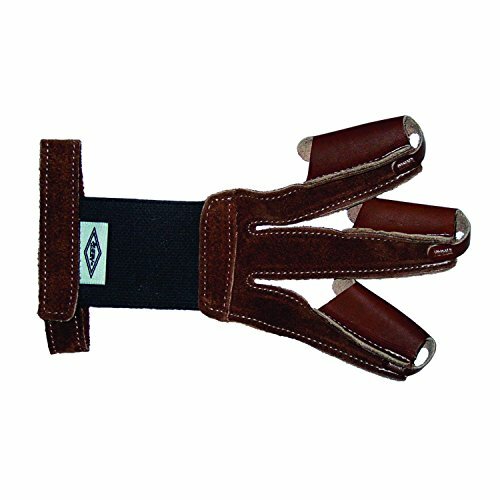 It is leather-made, yet the three finger design keeps it lightweight and easy to carry around and take off. Both left and right-handed users are in for a treat since this is an ambidextrous choice. Not only it is an excellent choice for younger individuals, but for beginners that desire a more straightforward product, provided they don’t have hands that are too large as people have reported that the adult-sized versions generally tend to be small, making them uncomfortable for some. Children and younger people that practice archery require protection designed for them, as long-lasting damage can be inflicted more easily on their joints. This model offers not only the strength needed but also a simplistic design that is lightweight and simple. Although some people prefer protection over ease of use, sometimes they sacrifice grip while losing finger sensitivity. Damascus is a well-known brand for having excellent protective gear, and this glove is a great contender for those that want a more natural feel to their shot. This product is made entirely out of leather except for its Velcro wrist strap, but the material is thin and comfortable for those that desire a better feel. Outside of the mobility it provides, this option is excellent for ambidextrous individuals. The sizing is usually on point with the user's measurements. With different options, it's advised to get a bigger size. You have to keep in mind that, generally speaking, your dominant hand tends to be larger than the other one, so it's recommended to measure both of them. Its main feature may be a double-edged sword, as it can be too thin for people that use bows with considerably higher draw weight. The fingers tend to get sore and numb after an hour or so of continuous use. It is, however, effortless to break in, taking only a few sessions to achieve its desired form. Depending on your hand, the Velcro wrist strap may be a little uncomfortable since it tends to make contact with the skin. The glove works better for users whose bow has a draw weight lower than 55 lbs or for those that are not going to use it for sessions longer than an hour. The design makes it comfortable and mobile for excellent grip and shots. In terms of effectiveness, this choice is at the top of the list. While several parts of this glove are made out of an elastic polyester, the fingertips have reinforced cowhide for improved strength. The JKER TECH gloves are probably the most lightweight and comfortable three finger design option on the list. The material is not a drawback as it is breathable, and also stays in place for a sustained amount of time. The fingertips tend to be thick, so it needs some time to break in. However, it is not too thick to cause users to lose finger sensitivity. It fits both left and right-handed individuals and it even has a model for young people. Although it may not have the durability of leather-made version, it makes up for it by being one of the best options of its type. It has a three finger design which results in it also being relatively lightweight and easy to take on/off. Out of the other choices on the list, this one is probably one of the most functional because it also comes in four different sizes, giving users more options to choose. 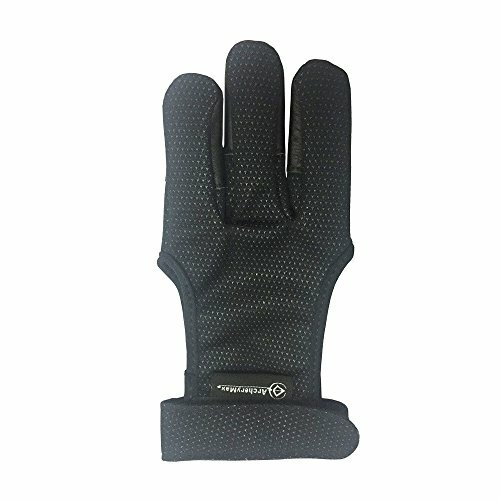 This model combines different materials which result in a functional alternative that has the best of leather reinforced fingertips and breathable grip of a polyester glove. It has an adjustable velcro wristband that helps to keep it in place. If this glove looks familiar, it is because it is the black version of the HandMade ArcheryMax that’s already on the list. There’s a lot more to talk about when it comes to this model, aside from the features we already covered. This alternative is excellent for people that desire more dexterity because it gives the hand a softer feel. There’s nothing to worry about with durability because the material does not compromise the quality. However, the design favors left-handed people for drawing the string with your dominant hand. Right-handed users may run into some discomfort where the adjustable wrist band sits. Shooting a bow with a higher draw weight demands gloves that can withstand the pressure. In doing so, people usually sacrifice finger sensitivity. This choice lets people shoot more powerful options for longer without losing sensation, so accuracy is still on point. Despite having a different color, this model retains the same great qualities as the ArcheryMax Handmade Brown Leather version. Consequently, it also has the same drawbacks concerning users that are right handed. If you favor a more traditional type of glove, then you may want to know about this model. Aside from many of the options on the list, this product is handcrafted. It has a design entirely made out of a thin cowhide leather which results in a comfortable fit. It has a velcro band to keep it adjusted to your wrist. The reinforced fingertips can be somewhat stiff during the first few uses, but it becomes more comfortable and natural with time, as the leather breaks in. It does run into problems with its sizing, with some people reporting that the size ordered is smaller than the one requested. When ordering gloves, it is generally advised to go one size bigger. The dominant hand is usually larger than the other, and this can affect grip. Loose equipment can be worse for your fingers in the long run. The Mountain Man leather shooting glove is an option for those that desire a cost-effective and simplistic, yet traditional design that comes in a three finger style with reinforced fingertips. As always is it advised that you measure your hand accurately before purchasing. At the end of the day, the most crucial aspect of your glove should be protecting your fingers, both in the short and long term. This matter, however, doesn’t have to get in between your accuracy, grip, and comfort. There are many options that can adjust to your style, so this is not something you have to lose sleep over. Archery gloves come in so many different styles and material that it can become overwhelming to choose one. While gaining protection is the main idea, there also other things to keep in mind while purchasing one so you ensure you are happy with the product. 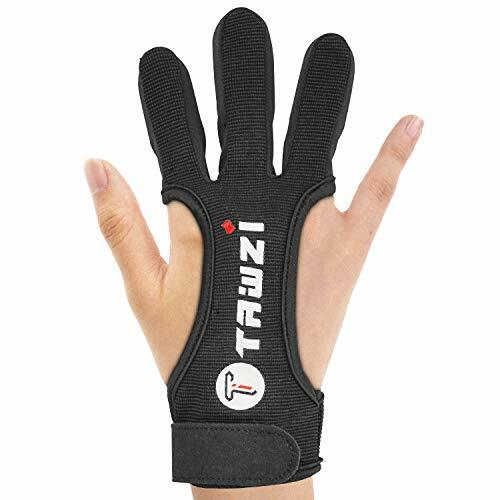 Archery gloves are a single piece of equipment designed to keep the bow user from injuring their fingers and joints while providing a tighter grip on the arrow for extra accuracy. They tend to have many designs and are, in general, a must-have if you’re serious about archery. How Do I Break-in My Archery Gloves? Just like your shoes, the most useful way to break in gloves is to use them often. It can be uncomfortable at first depending on the type, design, and material, but if you enjoy archery, then it should not be a significant problem. 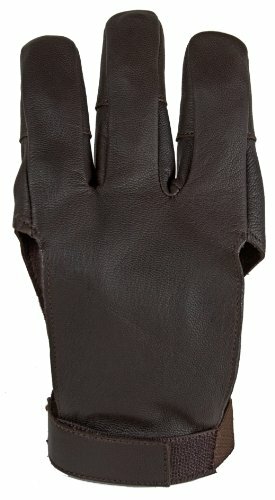 What is Best, Nylon, Suede, or Canvas Made Gloves? While the material has a significant impact on the general usefulness and durability of the glove, it’s the design that generally matters the most. Leather is usually more durable but is not breathable. Nylon is more breathable but not as durable. A good design eventually overcomes the issues a material may have. Sometimes the best option is the one that combines the best of each material. About 30 minutes before dark a group of 3 does came out of the swamp and worked with in 15 yards of me along the creek and into the pasture. Not 5 minutes later a thick racked 8 pointer came along that same path following the does. I drew back and covered his vitals with my 20 yard pin. The buck paused to sniff a drop of well placed doe pee I had laid out and I was ready to shoot when I realized- My gloves were so big and loose fitting I couldn't get my finger over the release trigger to loose my arrow. I learned a valuable lesson that day- Always put all your gear on and practice shooting your bow. Gloves, heavy coats and face masks all change the feel of the bow. Face masks can change the way the kisser button seats on your face, heavy coats can effect your draw and gloves can effect your release.Ever since that day in October I have opted for some light weight gloves and a muff that allows me to put my hands in and out easily even with my release on. When the weather is really cold I will often put a chemical hand warmer in the muff and my hands are usually warm and toasty all day. One of my first late season bow hunts was a cold December weekend and with temps in the teens I opted for some very heavy gloves. I set up in on the high side of a little stream leading from the edge of a swamp and some hard woods into a open pasture. We had been seeing a group of deer come out of that area every night close to sun down to feed in the pasture. The buck proceeded to spot me as I went from full draw back down to try and remove my release and glove and calmly walked off into the pasture well out of range never to be seen again. When the temps get below 40 degrees draw your bow and hold it then let down every 20-30 minutes to help keep your muscles warm and stretched out. Standing also helps keep you warmer. Take the first good shot you have at that spookey buck. Waiting for him to come just a few yards closer or turn just right for the shot and he'll be gone. Hunt the second rut. Around December 5th to the 15 give or take a few days does that were not successfully bread come back into estrous and you have a good chance of seeing a buck during the day. It can be cold but it is often worth it. Hunt the same areas you did during the first rut. Hunt the swamps and pines. Deer congregate in these areas when the weather gets cold. The thick pines covered with snow are warmer and provide great bedding cover. The temperatures inside a pine thicket can be as much as 10 to 15 degrees warmer then they are in the open hardwoods. Hunt the ground. When the temps really drop you are often better off hunting a ground blind near a food source or natural funnel. You'll stay much warmer and won't be so exposed as sitting in a tree that has lost all it's leaves. According to whitetail deer researcher Lenard Lee Rue the 3rd snow and rain dissipates your scent molecules and on cold dry days the mucous lining of a deer's nose is not as receptive as usual, so it is less likely to smell you.